With five manufacturers in the top six positions (unheard of! 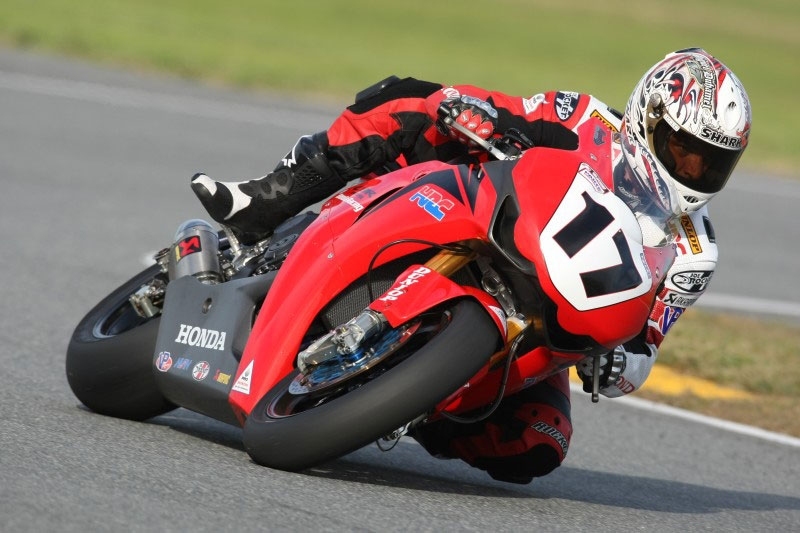 ), a first-time winner, and the requisite strategy, normal amounts of disappointment and heartbreak, and even some decent racing, you’d think the 67th running of the Daytona 200 would have been an excellent event. The AMA, displaying once again its unbelievable ability to turn a silk purse into a sow’s ear, made a couple of calls that left veteran observers rolling their eyes. Two days after the race, nobody even knows who won. Oh, Erion Honda’s Josh Hayes (defending Formula Extreme champion, which is the 200 class these days) won on the track after a picture-perfect ride. But shortly after the celebrations were over the AMA announced that technical inspection had revealed anomolies with Hayes’ Honda CBR600RR crankshaft and he’d been disqualified, handing the win to young Welshman Chaz Davies, riding for Attack Kawasaki (Attack won the race in 2007, with Steve Rapp aboard … Rapp finished third this year, now second). But of course, the Erion team is protesting the decision, so that’s going to be another month and a half of wrangling before the protest is settled. Nice work from the group that runs the self-styled "biggest race in America." The other major gaffe of the event had to do with Canadian ex-pat (he now lives in Las Vegas just down the road from Freddie Spencer) Miguel Duhamel. 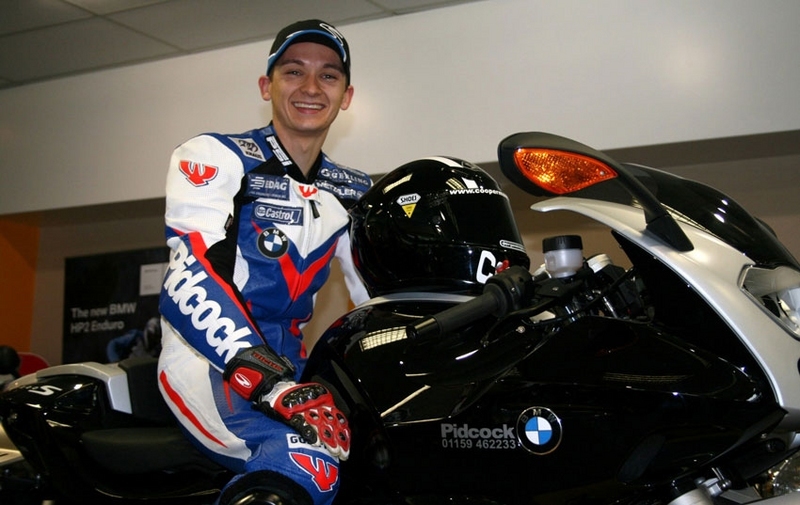 Miggie, chasing a record sixth Daytona 200, qualified on the front row, got a great start, led most of the first lap, then pulled into the pits with a fried clutch. Some frantic running around, and suddenly he’s back on track on his backup bike … WTF? There is an AMA rule allowing a bike swap in the first three laps of a race, IF the race has been stopped for a red flag — no red flag here, folks, but the AMA official on the ground at the time told Honda to go ahead and let him out. So Duhamel went back on track in 57th position and worked his way back up to fourth over the next 55 laps before another AMA official noticed and said, "Oops, that would be a mistake." Black flag, end of effort. Sad, really. 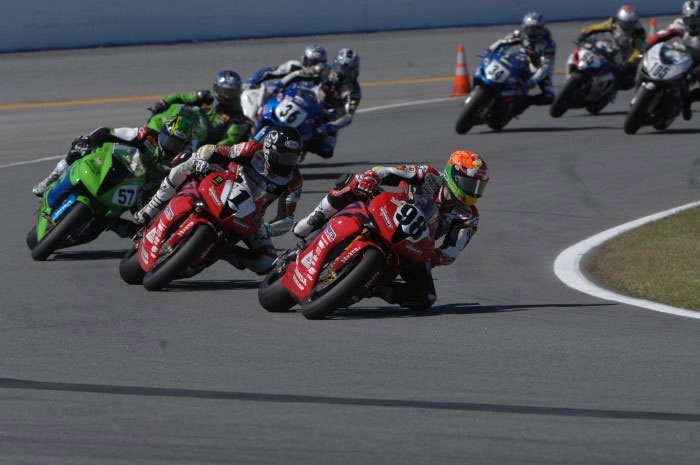 It’s too bad, because for a Daytona 200 miler it wasn’t actually a bad race. Hayes, his team-mate Jake Zemke (former factory Honda guy), plus American Honda’s Neil Hodgson and the Attack team were all on the pace, and to the surprise of many the brand-new and undeveloped Leo Vinci-sponsored Ducati 848 of Larry Pegram appeared in the hunt as well. As it happened, Zemke was derailed when a problem changing his rear wheel cost him four laps in his first pit stop, Hodgson’s CBR600RR puked its guts in a big-time embarrassing manner with only five laps remaining, the Attack guys lost some time over a pit stop mix-up (at least, Rapp did; he and Davies mistakenly came in together and Rapp was sent back out to do another lap, then had to return again for his pit stop. Turns out Davies mis-read the pit boards). Pegram ended up fourth after an excellent ride (or maybe third), and fifth (or fourth) went to young Columbian rider Martin Cardenas on a Suzuki GSX-R600 — this kid is going to be worth watching. Cardenas was followed by none other than two HP2 BMWs in the hands of Englishman Richard Cooper and California rider Brian Parriott. BMW is over the moon with the results in this make-shift one-off entry, and is apparently considering funding a run for the whole series by Parriott and his San Jose BMW team. You’ve gotta give DuHamel credit. After last year’s pace-cae screw-up, I mwouldn’t blame him if he told the AMA where to stuff their “America’s Greatest Race”. Now this! Just another example of the AMA’s inconsistent and inept application of their own rules… Expect mush better once Roger Edmondson gets to runs the show!